Over a year ago, I snapped this pic of Nina, who was at that time a bit more rotund than she is now. 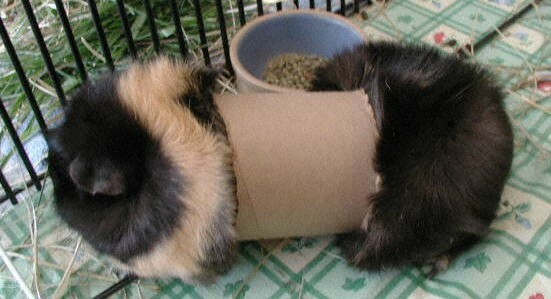 A warning went out to all cavy owners at CG concerning what could happen to their dear little pigs if they made the mistake of putting unslit cardboard rolls in their homes. I hope Nina won´t mind my displaying the pic one last time. "At the risk of being kicked off this board for negligence, I felt it important to warn people about the dangers of "toys" for their piggies. I think most of us have read the advice to slit those cute little tp tubes they so like to play with so they don´t get their heads stuck (especially the little ones). Well, I´m here to tell you that no matter what size roll you put in (unless it is humongous) you can run into trouble! I wasn´t gone 10 minutes when I came back and found Nina imprisoned in a tube that had been kicking around harmlessly for a couple weeks! I tell ya, guinea pigs are as much trouble as little kids! "Well, knowing that my advice might not be believed (and noticing she was breathing okay, but standing still, very still, with an angry look in her eye), I had the forethought to snap a pic. Please believe me when I say this did NOT interfere with my IMMEDIATE actions to rescue her from her predicament and cut her free (note, I did not carefully pose her on a silken pillow or make fun of her by attaching an electric cord or any such foolishness). "So, when someone tells you to cut those cardboard tubes, you listen! (I didn´t and look what happened to poor Nina!) And yes, that is her head on the left -- turned away in shame. "[After the initial shock and our speedy recovery (I hauled out the smelling salts), I realized we had here a picture of a fancy shoe buffing machine. Not sure exactly how to turn this into the gold mine it could be, but I now know our pets are totally under utilized and have many potential uses in the home.]" I have to say that it has always been one of my all-time favorite piggy pictures! It was one of the first "forum pictures" I saw after getting my pigs. I printed it out for my boys and Nina was on our fridge for about 6 months! A shoe buffer indeed!! I loved that picture too. Kind of tragic/funny -- makes you glad you're human and not a guinea pig! I still can't figure out how she managed that. Too funny. You really think the poor pig just happen to squeeze herself through that tube and Lynx just happen to have her camera ready? I thought you knew Lynx better than that. Last edited by Evangeline on Mon Jun 03, 2002 6:42 pm, edited 1 time in total. Oh, Evangeline, how naive. You don't really think anyone would give any weight at all to a tale like that. Such a grand imagination! Such determination! But we love you just the same (not). E -- you know it's not nice to make fun of Lynx' corset fetish. Hey, would you mind reposting that picture here? I'll try to track them down later. They were attachments -- makes it darn hard to find them. What happened to E's nick? Cruel and Unusual, did she get promoted or what? Several of us complained it was completely out of place. I stuck a more suitable replacement there -- but I will probably just remove it. She can come up with her own new one, so long as it is not along the lines of "Sweet and Innocent". Some posters do not understand irony and can get hit pretty hard. Speaking of E, where is she hiding? Oh wow, I actually laughed out loud at that one. I'm off to slit the little tubes now. My guys really could probably care less. They've never even noticed them before. They have more fun ringing the cat bell and grabbing the rattles in their teeth and shaking them. This annoys Tigger who responds with much rump-shaking and teeth clacking. Lynx - She can come up with her own new one, so long as it is not along the lines of "Sweet and Innocent"
When I first bumped into GL and I read your Heartless Dictator nick, it was quite clear what to expect from Sweet E without even reading one of her posts. Sweet and innocent, that's typical of Texels, isn't it? The new nick is quite good too.